BecA-ILRI Hub scientist Sita Ghimire describes the advantages of Brachiaria grass to Claes Kjellström, senior policy specialist at the Swedish International Development Cooperation Agency (Sida), in Nairobi, Kenya (photo credit: BecA-ILRI Hub/Marvin Wasonga). The original article on which this is based was written by Ethel Makila, communications specialist for the BecA-ILRI Hub. Results of a recent study by the Biosciences eastern and central Africa-International Livestock Research Institute Hub (BecA-ILRI Hub) and the Kenya Agricultural and Livestock Research Organization (KALRO), both based in Nairobi, indicate that the many people farming in Kenya’s semi-arid regions would profit in many ways from planting drought-tolerant Brachiaria grass. The study shows that Brachiaria grass improves not only the productivity of dairy and other livestock but also the health of soils. With Kenya’s arid and semi-arid lands making up 83 per cent of the country’s land area, the planting of Brachiaria grass in dry areas could have great impacts. Kenya’s drylands have marginal to low potential for crop production, not only because of lack of sufficient or regular rainfall, but also because the soils of these drylands are low in plant nutrients and prone to erosion. This collaborative research of the BecA-ILI Hub and KALRO demonstrates that cultivation of Brachiaria grass improves soil quality by increasing the amount of plant available carbon, nitrogen and phosphorous. The study, Effects of Brachiaria grass cultivars on soil microbial biomass carbon, nitrogen and phosphorous in soils of the semi arid eastern Kenya, is one of 24 papers recently published by KALRO on how Brachiaria grass helps farmers better cope with drought, the increases in milk and meat yields in animals fed Brachiaria grass, the central role this grass plays in improving soil quality, and the importance of establishing seed production systems to make Brachiaria seeds more available to farmers and profitable for farmers to grow. Sita Ghimire, a co-author and co-editor of the study and a senior scientist at the BecA-ILRI Hub leading its Brachiaria research, says this study is a culmination of pioneering research on the forage in East Africa. Livestock production already accounts for 10 per cent of the gross domestic product of Kenya, where a growing human population, increasing affluence and concomitant changes in food habits are increasing demand for livestock products. With more than 70 per cent of all the livestock in Kenya being raised in the country’s vast arid and semi-arid lands, research like this, to develop forage options that will increase and sustain livestock productivity in the face of climate change, is badly needed. 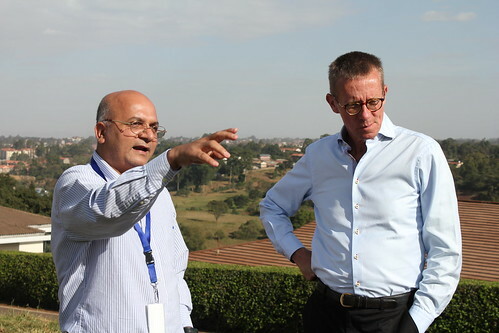 Sita Ghimire is a senior scientist at the BecA-ILRI Hub, which gratefully acknowledges Swedish funding of its project on Climate-smart Brachiaria grasses for improving livestock production in East Africa. Read the paper: EM Gichangi, DMG Njarui, M Gatheru, KW Ndungu-Magiroi and Sita Ghimire, 2016. Effects of Brachiaria grass cultivars on soil microbial biomass carbon, nitrogen and phosphorus in soils of the semi arid eastern Kenya. In: DMG Njarui, EM Gichangi, Sita Ghimire and RW Muinga (eds. ), 2016. Climate Smart Brachiaria Grasses for Improving Livestock Production in East Africa—Kenya Experience: Proceedings of a Workshop Held in Naivasha, Kenya, 14–15 Sep 2016. Nairobi, Kenya: Kenya Agricultural and Livestock Research Organization: 179–193. Read the original article written by Ethel Makila and posted on the BecA-ILRI Hub blog site: Climate-smart Brachiaria grass to help Kenyan farmers withstand global warming effects, 20 Apr 2017. Tags: Brachiaria, KALRO, Sida, Sita Ghimire, Sweden. Bookmark the permalink. Since posting this article, ILRI has received numerous requests from farmers for seed/cuttings of this grass. We would like to acknowledge each and every farmer who has sent in their request. While the national agricultural research program, Kenya Agricultural and Livestock Research Organization (KALRO, formerly KARI) does not have seed available for distribution at the moment, they are working hard to develop a database of farmers in different areas across the country who can supply cuttings. We will share this information as soon as it is made available.